Production: First Goskino; black and white, 35mm, silent; running time: 86 minutes at silent speed; length 1850 meters, or 6070 feet. Released 18 January 1926. Re-released 1956 with a second musical score by Nikolai Kryukov. Filmed from July through November 1925, in Leningrad, Odessa, and aboard the 12 Apostles (the sister ship of the Prince Potemkin of Taurida ). Producer: Jacob Bliokh; scenario and screenplay: Sergei Eisenstein, from an outline by Nina Agadzhanova-Shutko in collaboration with Sergei Eisenstein; titles: Nikolai Aseyev; photography: Edward Tisse; editor: Sergei Eisenstein; art director: Vasili Rakhals; music (original background score): Edmund Meisel. Cast: Sailors of the Red Navy; Citizens of Odessa; Members of the Proletkut Theatre, Moscow; Alexander Antonov ( Vakulinchuk ); Grigori Alexandrov ( Chief Officer Gilerocsky ); Vladimir Barsky ( Captain Golikov ); Alexander Lyovshin ( Petty Officer ); Beatrice Vitoldi ( Mother with baby carriage ); I. Bobrov ( Humiliated soldier ); Andrei Fait ( Officer on piano ); Konstantin Feldman ( Student Fel'dman ); Protopopov ( Old man ); Korobei ( Legless veteran ); Yulia Eisenstein ( Lady bringing food to mutineers ); Prokopenko ( Mother of wounded Aba ); A. Glauberman ( Aba ); N. Poltautseva ( School teacher ); Brodsky ( Intellectual ); Zerenin ( Student ); Mikhail Gomarov ( Militant sailor ). Eisenstein, Sergei, The Battleship Potemkin , London, 1968; as Potemkin , New York, 1968; also included in Three Films , edited by Jay Leyda, New York, 1974. Ginzburg, S. S., "Artistic Imagery in the Film The Battleship Potemkin ," in The History of Film , Moscow, 1960. Leyda, Jay, "On Potemkin ," in Kino: A History of the Russian and Soviet Film , London, 1960. Seton, Marie, S. M. Eisenstein , New York, 1960. Kleinman, N. I., and K. B. Levina, Bronenosets Potemkin—Shedevry Sovetskogo Kino (The Battleship Potemkin, Masterpieces of Soviet Cinema), Moscow, 1969. Mayer, David, Eisenstein's "Potemkin ," New York, 1972. Eisenstein, S. M., Autobiography , translated by H. Marshall and Toby Wright, London, 1978. Marshall, Herbert, editor, The Battleship Potemkin , New York, 1978. Murray, Edward, " Potemkin ," in 10 Film Classics , New York, 1978. Leyda, Jay, and Zina Vignow, Eisenstein at Work , New York, 1982. Eisenstein, Sergei M., Immoral Memories: An Autobiography , translated by Herbert Marshall, Boston, 1983. Aumont, Jacques, Montage Eisenstein , London, 1987. Eisenstein, Sergei M., Selected Works, Volume 1: Writings 1922–1934 , edited by Richard Taylor, London, 1988. Bordwell, David, Cinema of Eisenstein , Cambridge, 1993. Goodwin, James, Eisenstein, Cinema, and History , Urbana, Illinois, 1993. Lövgren, Håkan, Eisenstein's Labyrinth: Aspects of a Cinematic Synthesis of the Arts , Stockholm, 1996. Termine, Liborio, La drammaturgia del film , Torino, 1998. Mendel, George Victor, in Kinemathek (Berlin), 5 January 1926. Barrett, Wilton A., in National Board of Review Magazine (New York), November 1926. Hall, Mordaunt, in New York Times , December 1926. Grierson, John, in New York Herald Tribune , 5 December 1926. Variety (New York), 8 December 1926. Solski, "The End of Eisenstein," in Commentary (New York), March 1949. Evsevitsky, Vladislav, "Soviet Films in Pre-September Poland," in Kwartalnik Filmowy (Warsaw), nos. 3–4, 1951. Freilich, Semyon, "A Comparison of Potemkin and Ivan the Terrible: Eisenstein Today," in Soviet Literature Monthly , 1965. Montagu, Ivoe, " Potemkin in Print," in Sight and Sound (London), Summer 1970. Kuleshov, Lev, "Kuleshov, Eisenstein, and the others: Part II: Kuleshov on Eisenstein," in Film Journal (New York), Fall-Winter 1972. Kauffmann, Stanley, "Eisenstein's Potemkin ," in Horizon (London), Spring 1973.
" El Acorazado Potemkin ," in Cine Cubano (Havana), no. 89–90, 1974. "Epos Revolucii," in Iskusstvo Kino (Moscow), December 1975. Kieiman, N., "Tol'ko piatnadstat 'Kadrov," in Iskusstvo Kino (Moscow), no. 3, 1976. "A for a es a tartalom egysegenek iskoklapeldaja," in Filmkultura (Budapest), May-June 1976. Chanjutin, J., in Film and Fernsehen (Berlin), November 1977. Van Wert, W. F., in Sight and Sound (London), Summer 1980. Sklovski, V., "Krizník pluje desetiletími," in Film a Doba (Prague), November 1981. Wenden, D. J., "Film and Reality," in Feature Films as History , edited by K.R.M. Short, London 1981. Felden, D. L., "Vision and Violence: The Rhetoric of Potemkin ," in Quarterly Review of Film Studies (New York), Fall 1982. Roth-Lindberg, O., in Chaplin (Stockholm), 1983. Almendros, N., "Fortune and Men's Eyes," in Film Comment (New York), July-August 1991. "Yo postskriptum till unikt livsode," in Chaplin (Stockholm), no. 3, 1992. Biorsmark, C. "Odessa tror inte på trooper," Chaplin (Stockholm), vol. 36, no. 6, 1994/95. De Marinis, G. "I [love] Sergej," Cineforum (Bergamo), vol. 35, April 1995. Eisenstein, S.M., "Meggymag a lepcson," Filmvilag (Budapest), vol. 38, no. 8, 1995. Seesslen, G., "Die anderen Moeglichkeiten des Kinos," EPD Film (Frankfurt/Main), vol. 14, December 1995. Sorenssen, B., "Drama i sortehavet da Panserkrysseren Potemkin kom til Oslo," Z Filmtidsskrift (Oslo), no. 4, 1995. Musina, M., and others, "Boitsy vspominaiut minuvshie dni," Iskusstvo Kino (Moscow), no. 5, 1996. Vallerand, F., "Musiques pour Eisenstein," Sequences (Quebec), no. 183, March/April 1996. Sergei M. Eisenstein's Battleship Potemkin is one of the most influential films ever made as well as one of the finest examples of film art. On its release, the film brought immediate worldwide fame to Eisenstein and the new Soviet cinema and made an important contribution to the language of the cinema—the concept of montage editing. After the Bolshevik Revolution in 1917 the new Soviet government assumed control of the film industry, denounced the capitalist cinema of pre-Revolution Tsarist Russia, and decreed that the Soviet cinema was to be used for education and propaganda—to indoctrinate the Russian masses and to promote class consciousness throughout the world. Battleship Potemkin was made in order to celebrate the 20th anniversary of the unsuccessful 1905 Revolution against the Tsar. Although the film was originally supposed to chronicle the entire rebellion, Eisenstein decided to limit the story to just one representative episode—the mutiny on the Potemkin and the subsequent civilian massacre on the steps leading down to Odessa harbour. Battleship Potemkin , like Eisenstein's earlier film, Strike , has several documentary-like qualities. For example, Eisenstein cast most of the characters in the film according to the notion of typage—the selection of a non-actor to play a role because he/she is the correct physical type for the part. Eisenstein preferred to use non-actors since, as he explained, "A 30 year old actor may be called upon to play an old man of 60. He may have a few days' or a few hours' rehearsal. But an old man will have had 60 years' rehearsal." Eisenstein shot the film on location—on the Odessa steps and aboard the Potemkin's sister ship, The Twelve Apostles (the Potemkin had already been dismantled). The film has a collective hero; the Russian masses—the mutineers on the Potemkin, the people of Odessa, the sailors who mutiny on the other ships—who rebel against Tsarist oppression. Despite the film's documentary look, it was very carefully constructed on every level, from the distribution of line, mass, and light in individual shots to the perfectly balanced five-act structure of the overall film. The most remarkable feature of the film's construction, however, is the montage editing. Eisenstein's theory of montage—based on the Marxist dialectic, which involves the collision of thesis and antithesis to produce a synthesis incorporating features of both—deals with the juxtaposition of shots, and attractions (e.g. lighting, camera angle, or subject movement) within shots, to create meaning. Rather than the smooth linkage of shots favored by many of his contemporaries (e.g. V. I. Pudovkin and D. W. Griffith). Eisenstein was interested in the collision and dialectical synthesis of contradictory shots as a way to shock and agitate the audience. Eisenstein identified five methods of montage: metric, rhythmic, tonal, overtonal, and intellectual. Metric montage concerns conflict caused by the lengths of shots. Rhythmic montage concerns conflict generated by the rhythm of movement within shots. In tonal montage, shots are arranged according to the "tone" or "emotional sound" of the dominant attraction in the shots. In overtonal montage, the basis for joining shots is not merely the dominant attraction, but the totality of stimulation provided by that dominant attraction and all of its "overtones" and "undertones": overtonal montage is, then, a synthesis of metric, rhythmic, and tonal montage, appearing not at the level of the individual frame, but only at the level of the projected film. Finally, intellectual montage involves the juxtaposition of images to create a visual metaphor. All five types of montage may be found in Potemkin' s Odessa Steps sequence in which Tsarist soldiers massacre Odessa citizens who are sympathetic to the Potemkin mutineers. An example of metric montage is the increase in editing tempo to intensify audience excitement during the massacre. Rhythmic montage occurs in the conflict between the steady marching of the soldiers and the editing rhythm, which is out of synchronization with the marching, as well as the chaotic scrambling of the fleeing crowd, and the rolling movement of a runaway baby carriage. Tonal montage occurs in the many conflicts of planes, masses, light and shadow, and intersecting lines, as in the shot depicting a row of soldiers pointing their rifles down at a mother and her son, the soldiers' shadows cutting transversely across the steps and the helpless pair. 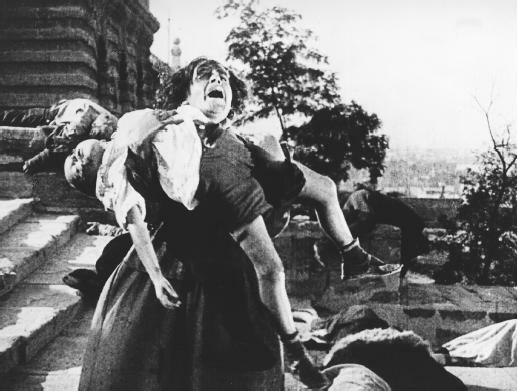 Although Eisenstein claimed to have discovered overtonal montage while editing Old and New four years after Battleship Potemkin , overtonal montage can be detected in the Odessa Steps sequence in the development of the editing along simultaneous metric, rhythmic, and tonal lines—the increase in editing tempo, the conflict between editing and movement within the frame, and the juxtapositions of light and shadow, intersecting lines, etc. Finally, there is an example of intellectual montage at the end of the sequence, after the Potemkin has responded to the massacre by firing on the Tsarist headquarters in Odessa. Three shots of marble lions—the first is sleeping, the second waking, and the third rising— seen in rapid succession give the impression of a single lion rising to its feet, a metaphor for the rebellion of the Russian masses against Tsarist oppression. When Battleship Potemkin was first released, it drew mixed reactions in the Soviet Union: many people praised the film, while others denounced it, charging Eisenstein with "formalism"—a preference for aesthetic form over ideological content. However, once they realized that foreign audiences loved the film, Soviet officials began to support it, and it soon became a popular and critical success, both inside and outside the Soviet Union. Today Battleship Potemkin ranks with The Birth of a Nation and Citizen Kane as one of the most influential films in cinema history.